Disney is seeking to bridge the story gaps between its two Tron movies with this graphic novel, TRON: BETRAYAL. My gut instinct was to resist the hype, but I have to say that this story stood up fine on its own, for the most part. 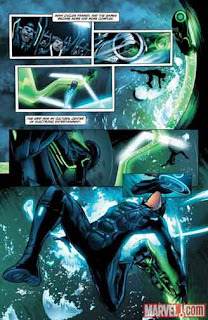 This graphic novel by writer Jai Nitz is touted as a prequel to the movie, Tron: Legacy, and is designed to show how the virtual world moved forward with advancements and then started to fall apart when new elements were randomly introduced (through the computer-created species of Isomorphs). The world's “creator,” Kevin Flynn (played by actor Jeff Bridges in the movie), is caught between the stresses of his real world (where the birth of his son, Sam, is balanced by the unfortunate death of his wife) and the world of the virtual reality Grid, where the designed order of the world is being threatened by chaos. There are times when the story veered off on strange tangents, and I was scratching my head here and there, but I was thankful for a narrative trope that really worked: an ongoing comparison of the virtual world to Rome, which rose and then fell with similar brilliance. 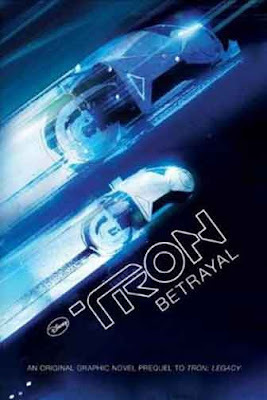 TRON: BETRAYAL works best for readers with some knowledge of the first Tron movie, but that's not necessary. If you can envision a world inside your computer that has its own rules and structure, then TRON: BETRAYAL is sure to engage you as a reader. 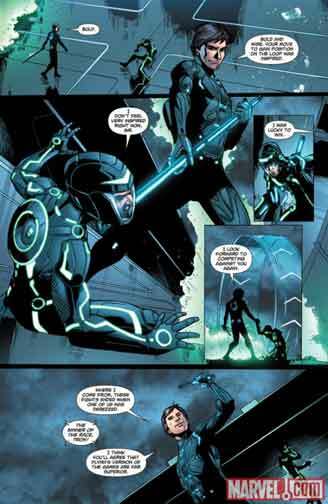 I thought the art here in TRON: BETRAYAL was engaging, as artist Andie Tong really uses dark blue hues and bright whites, and angled frames to show us the virtual world that Kevin Flynn has created, and which he returns to when he can. The scenes of the games being played in the virtual world, while visually delightful, were all too often too confusing for me to follow, as they often arrived on a page with little context. I cared less about the games in the Grid, and more about the personalities of power playing out in the virtual world. There are going to be those geeky kids who will eat up any and all version Tron, including this book, and there will be those who won't have anything to do with it. This book is for the former, for sure. I do find it interesting that the story of virtual worlds and video gaming coincide here, and an interesting discussion might revolve around how far technology has taken us and where it is going. I recommend this book but, honestly, it is for a select audience. I imagine high school students (OK, boys) will be the likely audience for this story. The narrative device of moving from real to virtual worlds may be too confusing for middle school readers, and most certainly will be difficult reading for elementary students. Yesterday in my office, I read an article of TRON Legacy and then I made a plan and finally yesterday night I saw its review and it was great... Actually I like the beginning of the movie the most probably I like the 3D effects. Enjoy it.